Honestly, you want something more elegant right? Modern kernels (2.6.13 and later) have filesystem notifications in the form of an interface called inotify. You can use these calls programmatically with the sys/inotify.h header file. There is also a set of command-line programs you can install, usually packaged as inotify-tools. That’s better, I think. It doesn’t wake up frequently, only when something has changed. I figure any sane program putting something in the directory will either open the file for writing and close it, or it will move it. Either way will work and the %f tells the command to report the file name. There are other events you can wait for as well, of course. If you are wondering why the move case is necessary, think about how most text editors and network download software works. Usually, a new file doesn’t have the final name until it is complete. For example, Chrome will download the file test.txt as test.txt.crdownload or something like that. Only when the file is done will it rename (move) the file to test.txt. In the lower terminal, issue the inotifywait command. Don’t forget the period at the end which tells it to monitor the current directory. 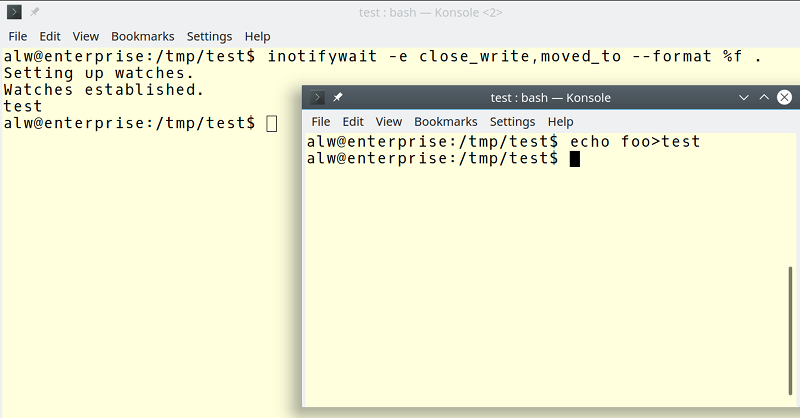 Then in the other terminal create a file in the same directory. The name of the file will appear in the first terminal and the program will exit. The script just takes advantage of this behavior to set the FN variable, takes action, and then relaunches inotifywait. You can ask the program not to quit, by the way, but that makes scripting a little more difficult. However, it also removes the problem of a file changing while you are doing your processing. The other command line, inotifywatch, also outputs file change events but it watches for a certain amount of time and then gives you a summary of changes. I won’t talk about it any further. If you think you need that capability, you can read the man page. The script is still less than ideal, though. Presumably, a system might have lots of different directories it wants to monitor. You really don’t want to repeat this script, or a variation of it, for each case. The $@/$# at the end provides a full path to the file affected. You can also grab the vent time as text ($%) or a number ($&). You can monitor all the usual events and also set options to do things like not dereference symbolic links. You can find it all in the incron man pages. I’m not a big fan of GUI editors, but I know I’m in the minority. 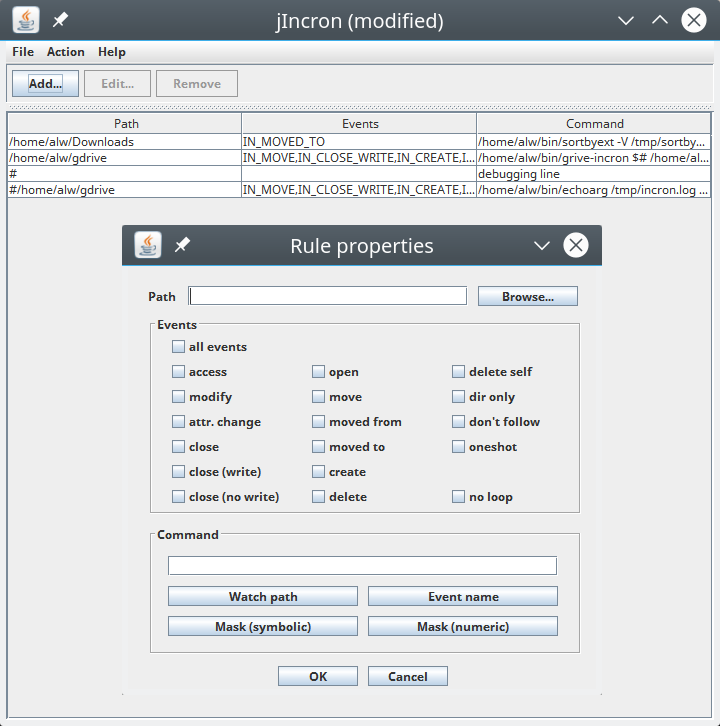 If you like, there’s a Java-based incrontab editor available. There isn’t much documentation, but you can import your incrontab — if it exists — from /var/spool/incron/your_user_id. If you look at the image below, you can see it offers a form that builds the incron table line for you. You can find the system files in /etc/incron.d, usually. All the locations can be set by the /etc/incron.conf file, so if you aren’t sure where to look or you want to change the location for the table files, start there. Using incron is quite elegant. A system program does all the waiting and our script only runs when necessary. It is easy to look and see all the things you have notifications set for. You can do a lot with these tools, and not just in the embedded space. How are you going to use them? It looks like something converted your backticks to single quotes in the inotifywait example. It’s better form to use $(command) instead of backticks, and it won’t get mutilated by your CMM. Ah. WordPress. I’ll fix when I’m back at my desk. It’s also converting the tack before the e into some similar but incompatible character. Oh my. We are going to start the systemd vs non-systemd comment thread…. Real Admins don’t care about systemd vs. initd. Real Admins have their own init script (often perl) as an easier and more flexible alternative to all those tetchy little standard files in /etc. All your static IPs, mount points, etc, everything in one handy file. There’s actual uses for such a hack, but there’s really good reasons not to, especially on multiuser, production systems that others will have to support. There is nothing to discuss anymore. Every major Linux distro uses systemd now. And incron is now unmaintained for years. There are alternatives to incron and systemd-path, but most of them are not in the repos of your distro..
Where I work gidget handles thousands of file transfer triggered events a day. I know I should not feed the troll. But you know some people are having fun with init scripts and are running without systemD. I use OpenRC, So if any solution involves installing systemD and sh*tloads of dependencies, it is NOT a solution. Especially for an embedded system. For the love of $DEITY, don’t parse the output of ls. In case anyone sees the first script and thinks to themselves “it’s dirty, but it works”, you’re wrong. Read this: https://mywiki.wooledge.org/ParsingLs . Long story short: you can easily fix the globbing behaviour in an empty directory by doing the `shopt -s nullglob` command at the beginning of your script. BUT DON’T PARSE LS — EVER! Well it was an anti-example. Should read “Thanks. You further support my anti-example.” Should be no offence taken there, you did a fine job. …sssssssssht… don’t mention it too often or all the hipsters will crowd shell providers and IRC! Scripts that scan a directory for new files need to have time/date checking on them and some other type of “GO” indicator, or secondary target directories. Example: I want to move a transaction file to a disaster mirror and apply the transaction log to keep it current. The big problem is you need to make sure you aren’t writing to the file and are done with it totally, this can be solved by using 2 directories and renaming the file to the target directory when ready – then you know it’s safe to use. Also, recursion can occur it you run the same job on multiple machines for workload balancing. I setup a whole system for a similar case where a record comes down from ERP software, and you need to apply it to a reporting SQL database, and of course that gets applied to the disaster backup. It can be a real pain, especially for things like applying updates, where you need to take down jobs and start them in the correct order. Timing is obviously a big factor – you need to write it to be entered at any time of the process without backfiring. Yes that’s what I do! I’m surprised it took so long to come up. Before I found ‘watch’ (which is not posix but gnu so not available by default on systems like macOS), I used to use a simple bash loop with a delay. The comments here are my idea of positive diversity. Thanks everyone, it is very helpful to have all that information and different perspectives, put so logically. fswatch on Linux, macOS, BSD, and Windows would be a portable way to implement this same functionality. Just replace inotifywait with fswatch and modify the arguments appropriately in your script. fswatch is in ports for BSD and macOS, available via Debian and Ubuntu repos, and you’ll have to use Google to find a Windows build. fswatch will use the operating system’s native filesystem monitor: inotify on Linux (inotify is way too slow for rapidly changing files), FSEvents on macOS (no known limitations), kqueue on BSD (limited number of files it can watch), ReadDirectoryChangesW on Windows (only reads entire directories; you have to figure out which files changed on your own), “File Events Notification API ” on Solaris (no known limitations), and “poll” which stats in a loop on any POSIX compatible system (usable but non-performant). i.e., if rapid file change notifications on lots of files are what you need then Solaris is likely the best option. But then that is the kind of workload it was designed for. quite a few of these methods don’t work on shared directors where the remote system updates the files (ie inotify) – so be careful and test test test! My main beef with inotify is that it doesn’t have any provisions for a global wildcard. It should of course be root only and security-restricted, but Crashplan and other backup applications that try to keep up with file changes are currently forced to request a watch on every single file in the system. This mandates that the backup program trudge through the entire filesystem upon boot to initiate the watches, then maintain them along with the associated kernel overhead (which is significant, when watching millions of files). I should add Debian 9.4, I suppose. inotify is quite handy. I employed it several years ago when hired to track down an active intrusion on a university server which had entirely too many users (and professors who delegated their accounts to assistants, and very likely did not change credentials between) – isolating the host to fix things wasn’t an option. They had wordpress too, which was a major pathway. By the time I came onboard, the intruders had many backdoors on the system, and all it took was one of them to springboard more. As I’d identify backdoors and disabled them, I’d add them to an inotify process I’d written so that I could more directly associate inbound traffic and see where else they’d head after finding something missing. “Whack-a-mole”-ing a compromised WordPress install is a super PITA. I tried that one time, but ended up just wiping reverting to a backup (thankfully) then updating.